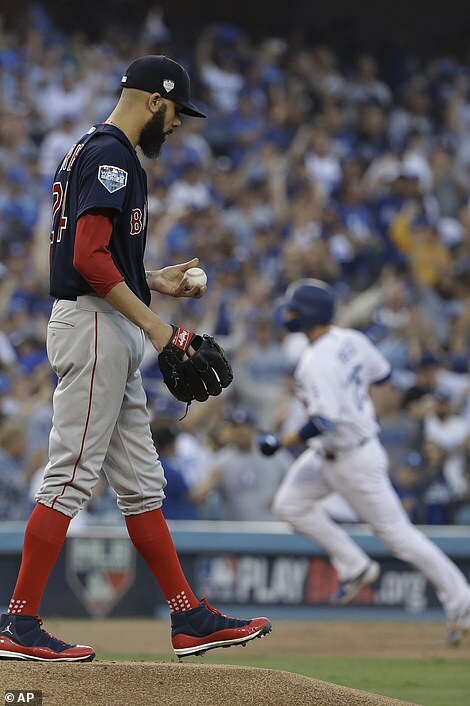 Pitching on just two days rest, Boston Red Sox starter David Price yielded a home run on the first pitch of Game 5 of the World Series on Sunday, but followed with six scoreless innings as his teammates knocked four home runs and the franchise secured its ninth Major League title with a 5-1 win over the Dodgers in Los Angeles on Sunday. 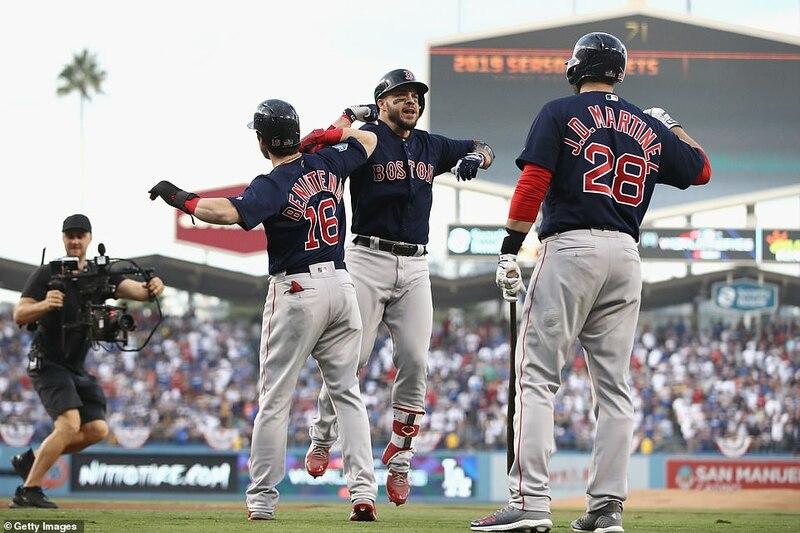 Boston’s Game 4 hero, Steve Pearce, hit a pair of home runs while Mookie Betts and J.D. Martinez added solo home runs of their own for the easy win. Pearce was named World Series MVP after homering three times and driving in seven runs in Games 4 and 5. 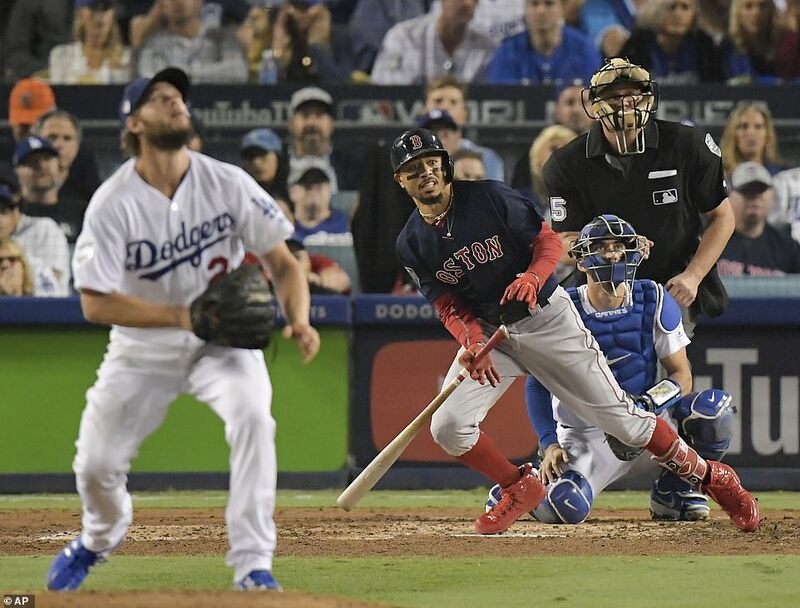 According to the Elias Sports Bureau, Pearce is the first position player to win the series MVP after playing in 50-or-fewer games with the winning team at the time of the World Series. 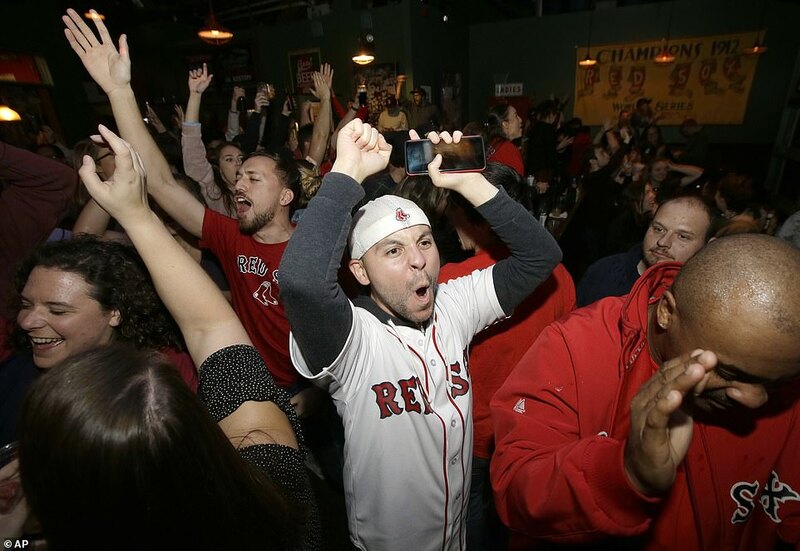 Pearce, a lifelong Red Sox fan, was acquired by Boston from Toronto before the July trade deadline. Pearce joined former Hall of Famer Babe Ruth and former Cincinnati Reds slugger Ted Kluszewski as the only players 35 or older to hit multiple homers in a World Series game. ‘Sure, that’s great company,’ Pearce said afterwards. ‘Those guys were the best. And if my name gets to sit right next to theirs, I know I’ve accomplished something. 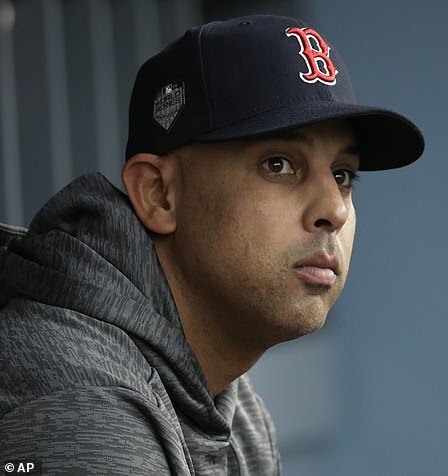 Red Sox manager Alex Cora became the first from Puerto Rico to win a title. He is just the fifth rookie manager in Major League history to win a World Series. 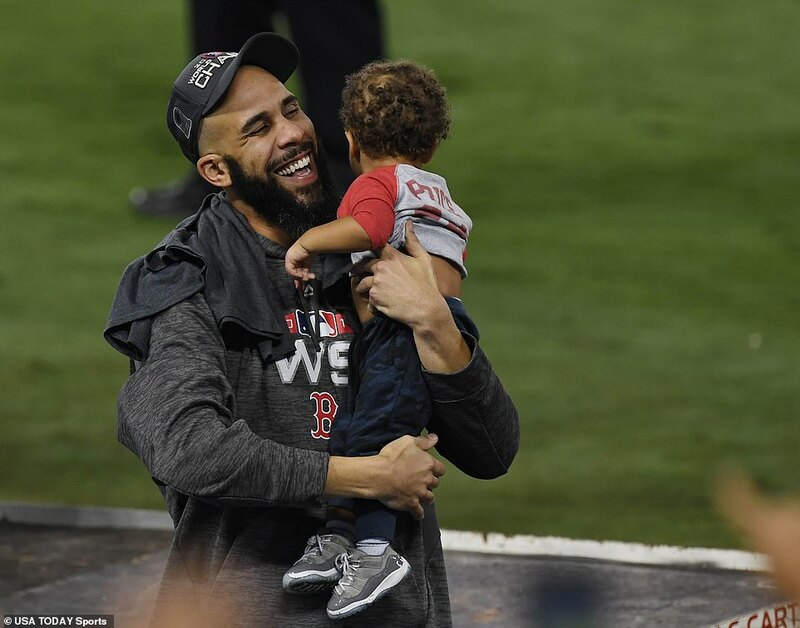 Price said winning the World Series was the whole reason he came to Boston. ‘Seeing all these grown men over there just acting like little kids, that’s what it’s all about,’ he added. ‘To come out on top the way we did is unreal. ‘This is why I came to Boston. I know it is a tough place to play and challenging with everything that was going to go on there. 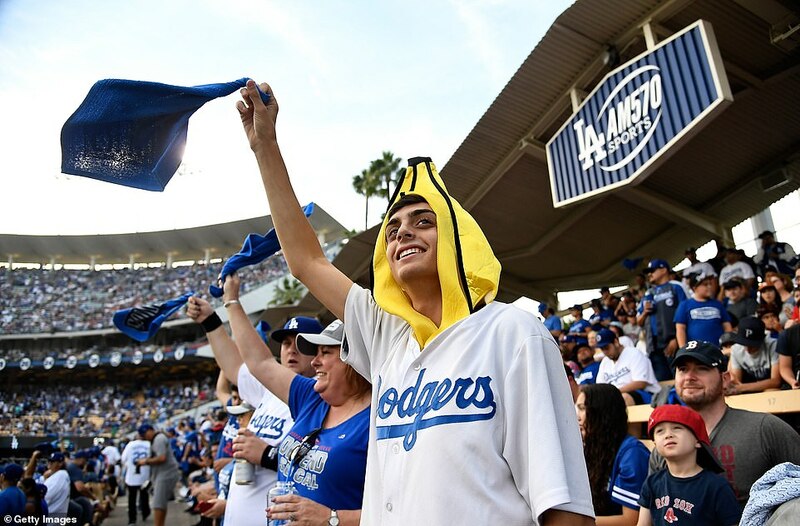 The Dodgers and their fans arrived at Chavez Ravine on Sunday knowing only 13 teams had clawed their way back from 3-1 deficits to win a best-of-seven postseason series. 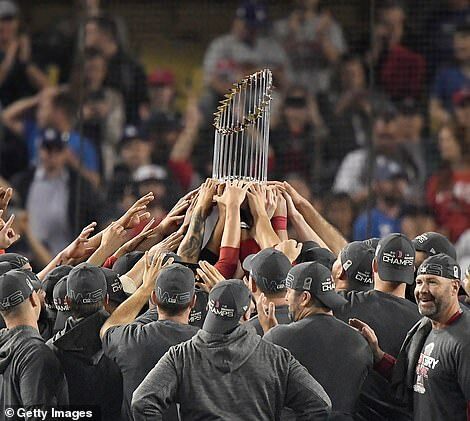 The last to do it was the Chicago Cubs against the Cleveland Indians in 2016 as they claimed their first World Series crown in 108 years. 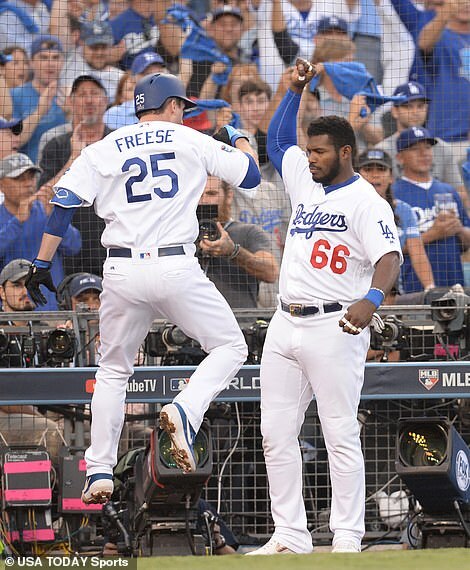 Dodgers first baseman David Freese led off the bottom of the first with a home run, but Price was unflappable afterwards, pitching into the eighth inning. With the win, Price has now defeated Cy Young winners (Houston’s Justin Verlander and Los Angeles’ Clayton Kershaw) to clinch each of the last two postseason series. 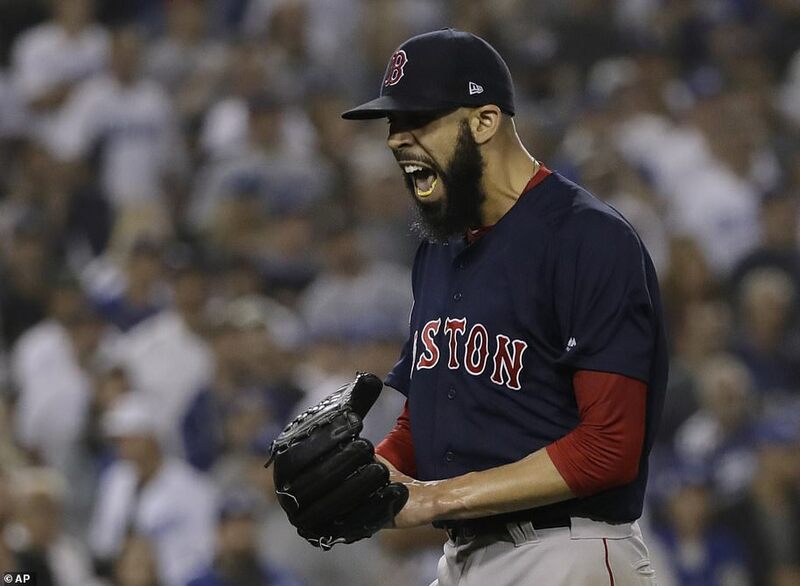 Price pitched in relief of Game 3 on Friday, and was slated to take the hill if the series went to Game 6 in Boston on Tuesday. Red Sox ace Chris Sale was expected to get the nod, but manager Alex Cora opted instead for Price. 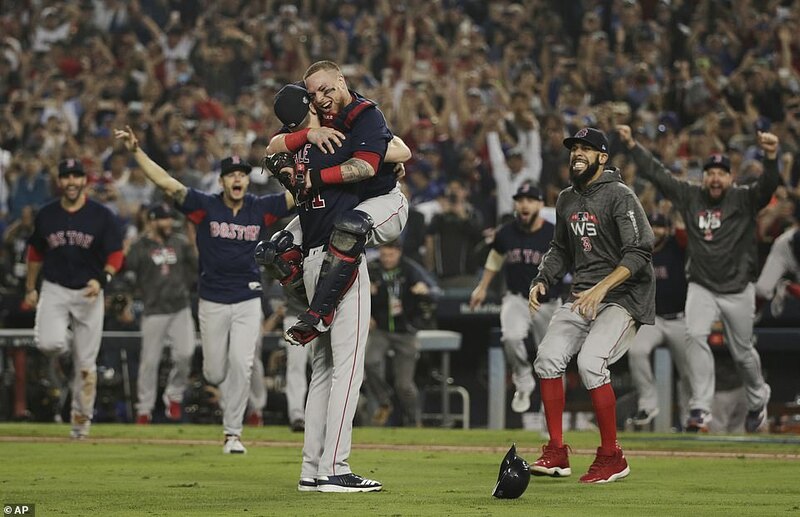 Sale actually pitched in relief in the ninth inning, and was on the mound when Boston won its fourth World Series title over the last 15 years. 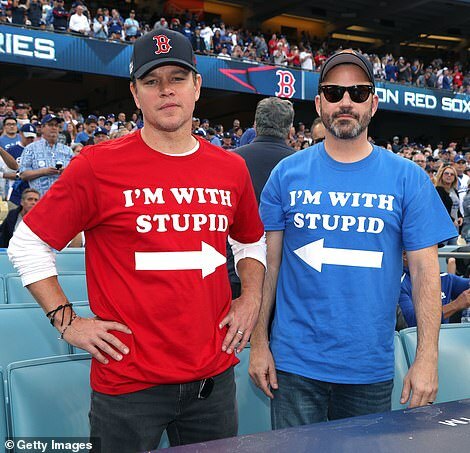 It’s safe to say Matt Damon’s t-shirt was more appropriate that Jimmy Kimmel’s after Boston’s Game 5 win in L.A. 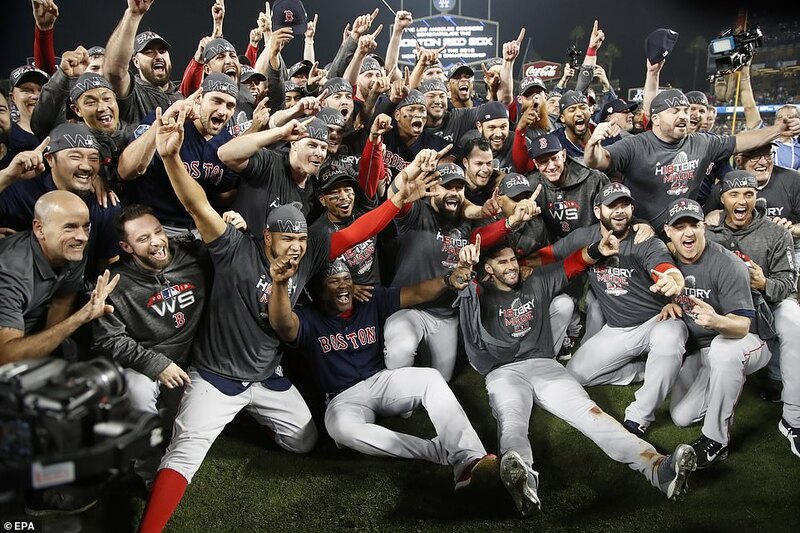 The Red Sox previously had five World Series titles, all of which were won before the franchise sold Babe Ruth to the rival New York Yankees after the 1919 season. 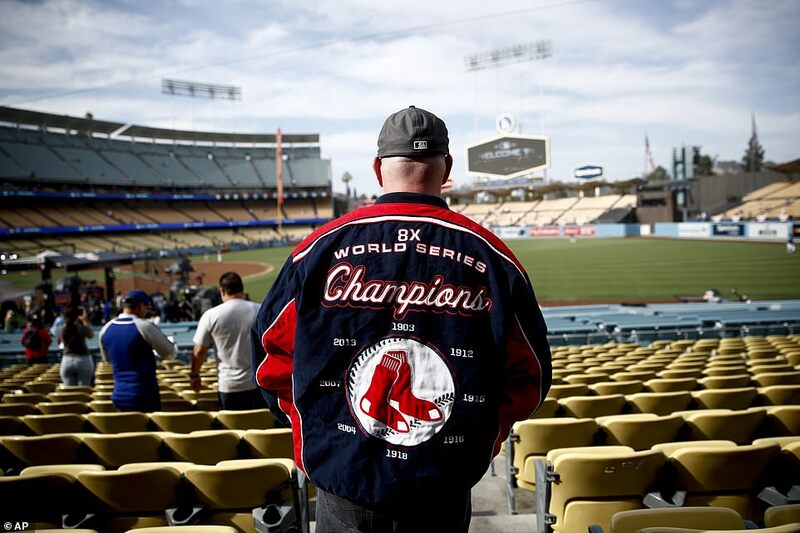 Although the franchise came close several times, Boston did not win a World Series between 1919 and 2003. 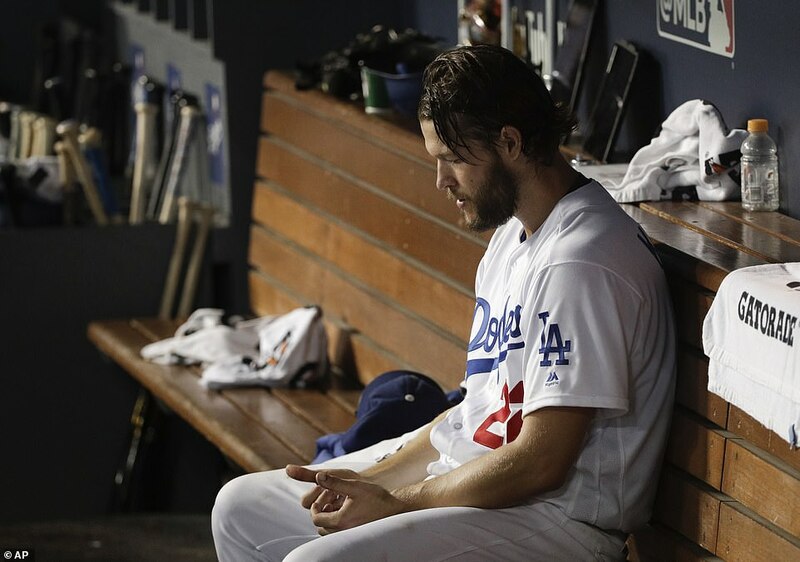 For the Dodgers, the frustration continues. 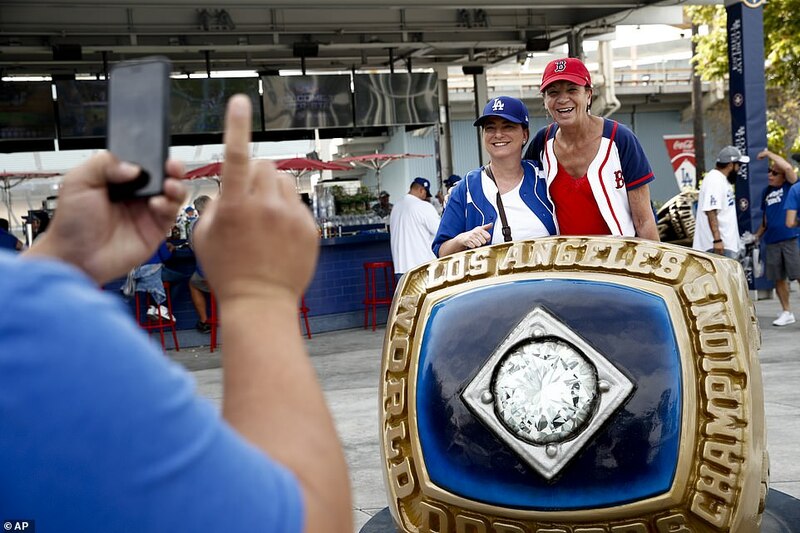 Not only has Los Angeles failed to win a title since 1988, when the Dodgers beat the Oakland Athletics, but the team actually reached the postseason in each of the last six seasons without winning a championship. 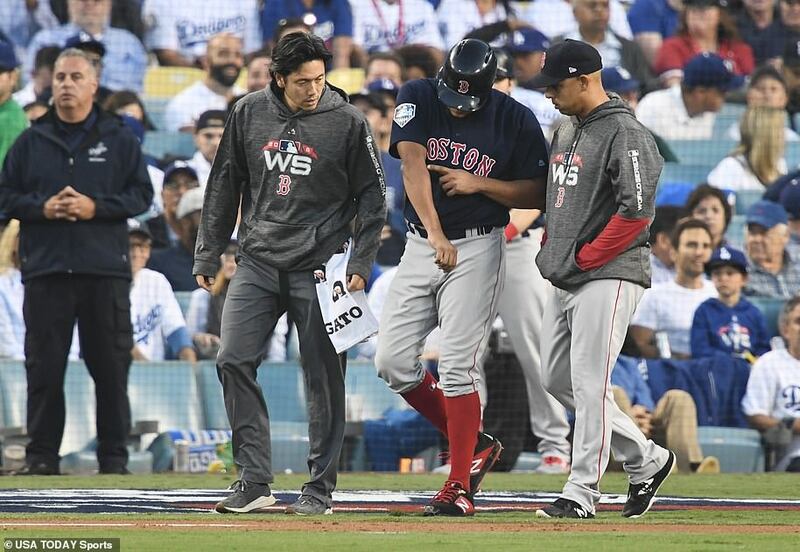 Price, who pounded his chest upon leaving the field after the seventh, went seven-plus innings, giving up a run on three hits and two walks. He struck out five. ‘Well, I can’t say enough about our ballclub, the fight, the [way they] compete,’ Dodgers manager Dave Roberts said afterwards. ‘All year when it didn’t look so good, our guys stuck together, stayed the course and believed in one another, and put ourselves in a chance to win a championship. The Dodgers held a 4-0 lead in the top of the seventh inning in Game 4, and nearly tied the series. 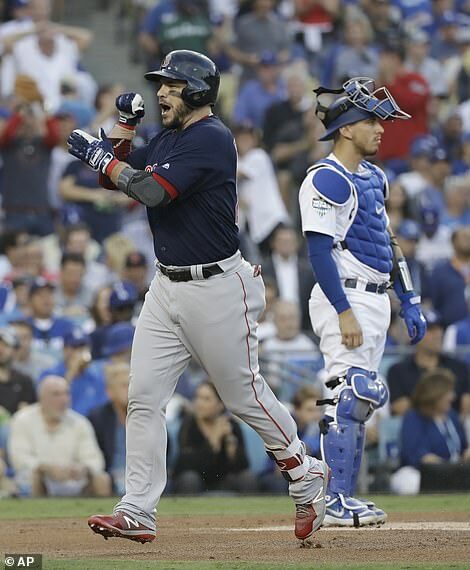 However, a three-run double by Pearce helped Boston complete the comeback win, which set up Sunday’s clincher. 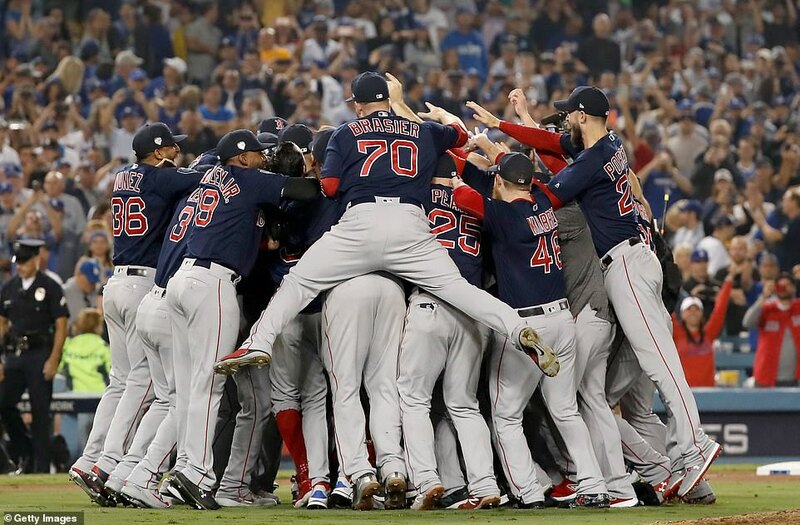 Roberts had been criticized – most notably by President Donald Trump on Twitter – for removing starter Rich Hill, who had pitched six strong innings and left with the 4-0 lead intact. For a dozen years, Steve Pearce was on the move. From Pittsburgh to Houston to every single team in the AL East, just looking for a spot where he could stick. 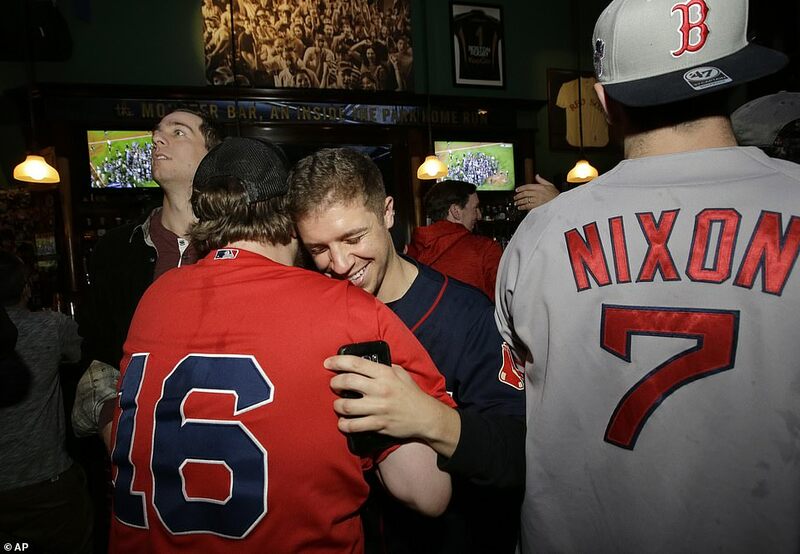 He finally found his permanent place – in Red Sox lore. 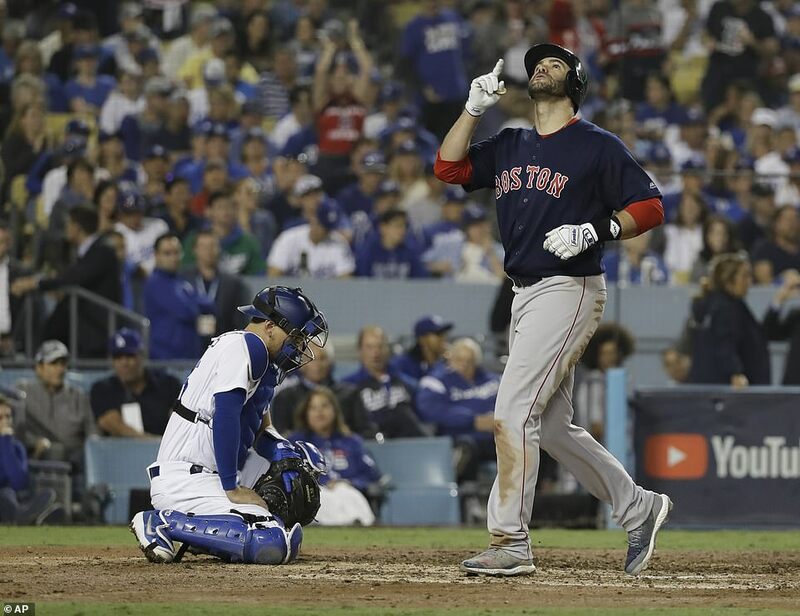 The well-traveled journeyman wound up as the World Series MVP on Sunday night after hitting two home runs that sent Boston over the Los Angeles Dodgers 5-1 in Game 5. 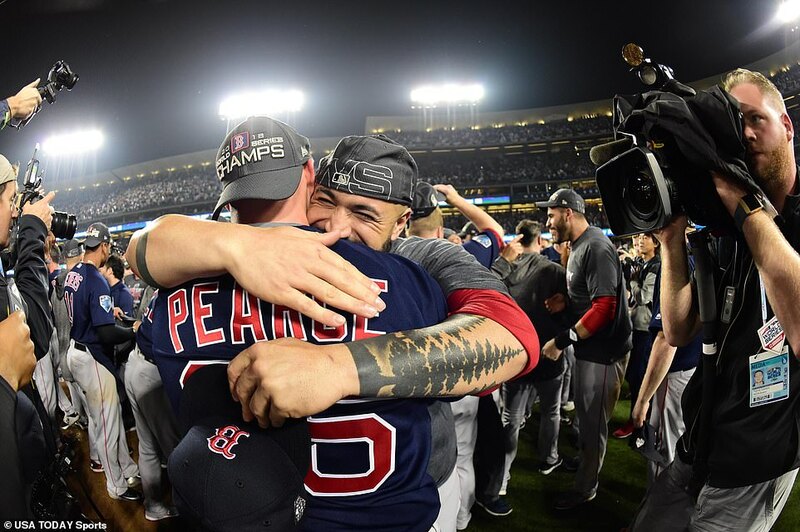 ‘This has been the funnest year of my life,’ Pearce said on the field at Dodger Stadium. 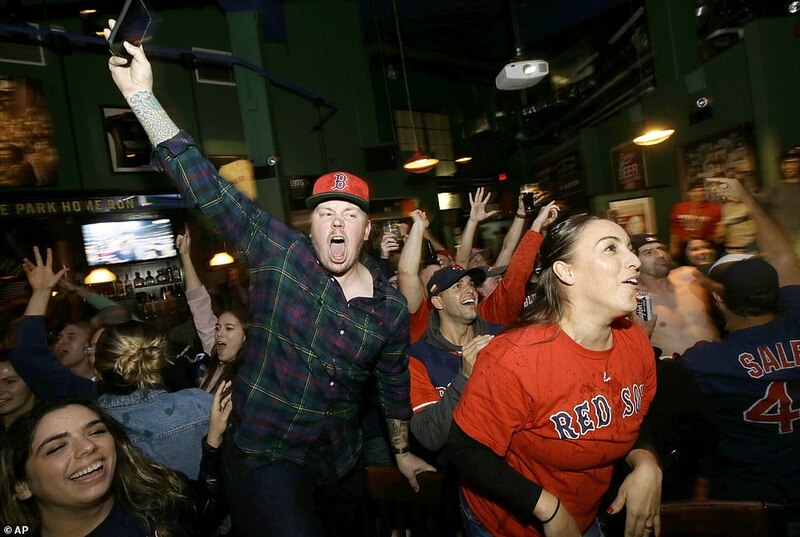 It got better and better, too, as hundreds of Red Sox fans in the stands chanted ‘MVP! MVP!’ Later, he strolled hand-in-hand with his young daughter behind home plate. 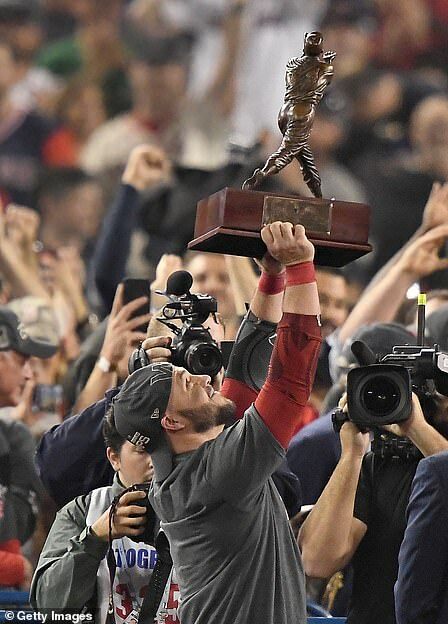 For a guy who just kept on truckin’ around the majors, he now has something shiny to show for it – a bright red truck, presented to him on the infield dirt as a most unlikely MVP. Pretty good production for a guy acquired in midseason for a minor league infielder. 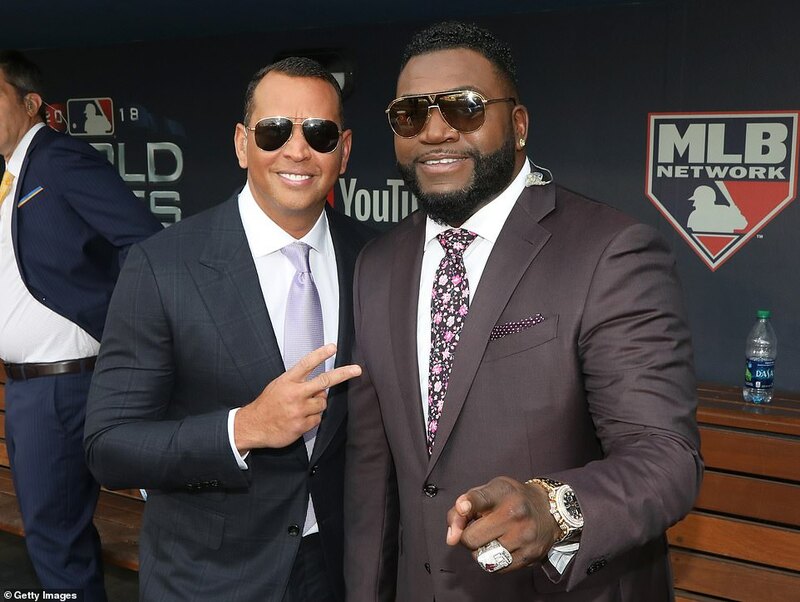 He played 50 games after the trade – he became the first position player to win a World Series MVP while playing 50 or fewer games for the winning team in his career, the Elias Sports Bureau said. 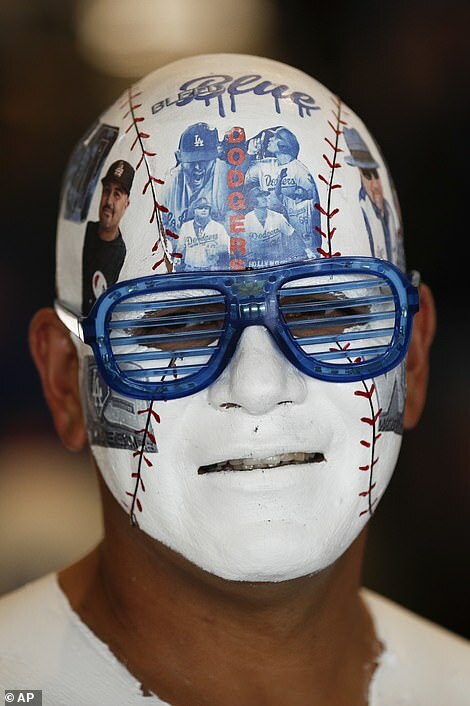 As always, Dodger Stadium was filled with celebrities for a World Series game. 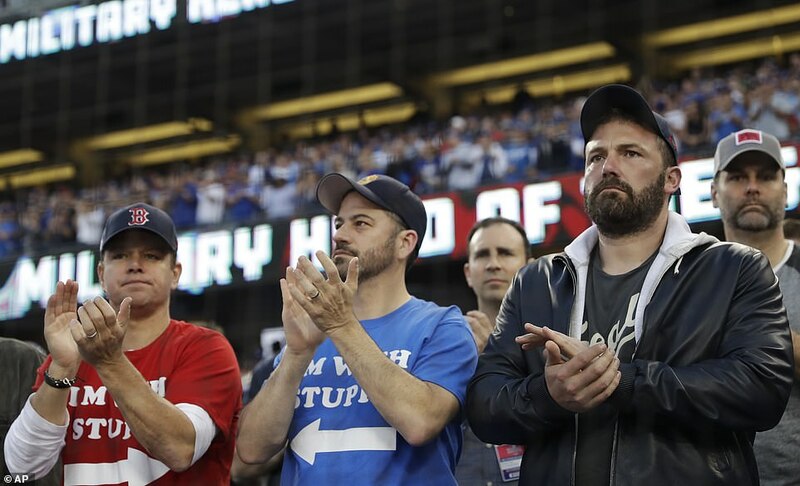 Actor Ben Affleck join friends Matt Damon and Jimmy Kimmel, both of whom were wearing ‘I’m with stupid’ t-shirts with arrows pointed at each other. 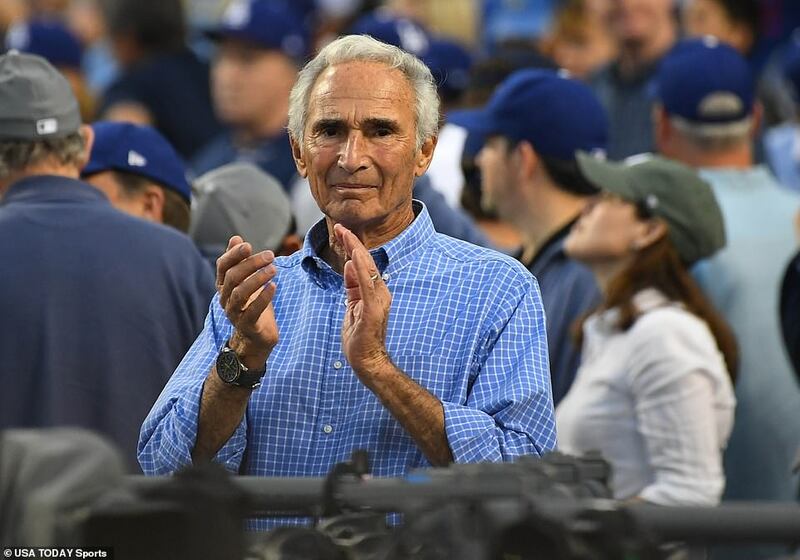 Dodgers legend Sandy Koufax was also in the crowd. Other celebrities in attendance were game show host Pat Sajak, former Major League player and manager Joe Torre, retired slugger Dave Winfield, actor Jason Bateman, director Judd Apatow and his actress wife Leslie Mann, and PGA legend Fred Couples. 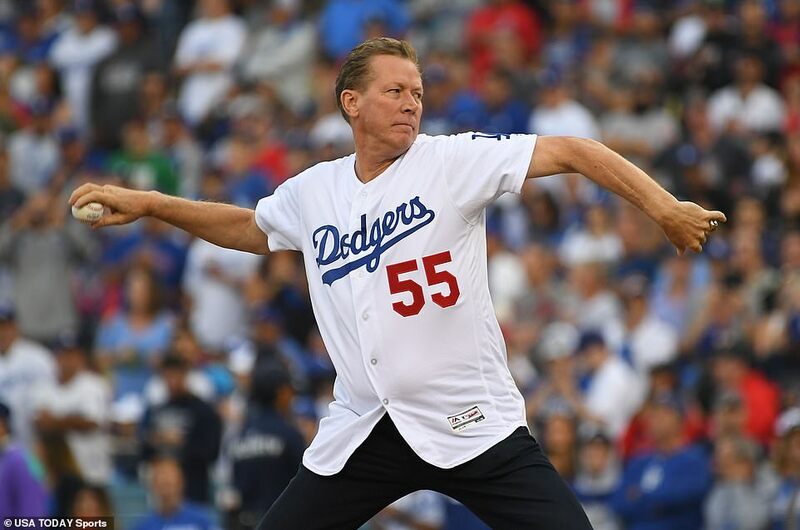 Former Dodgers ace Orel Hershiser threw out the first ceremonial first pitch. He was a member of the last Dodgers team to win a title in 1988. 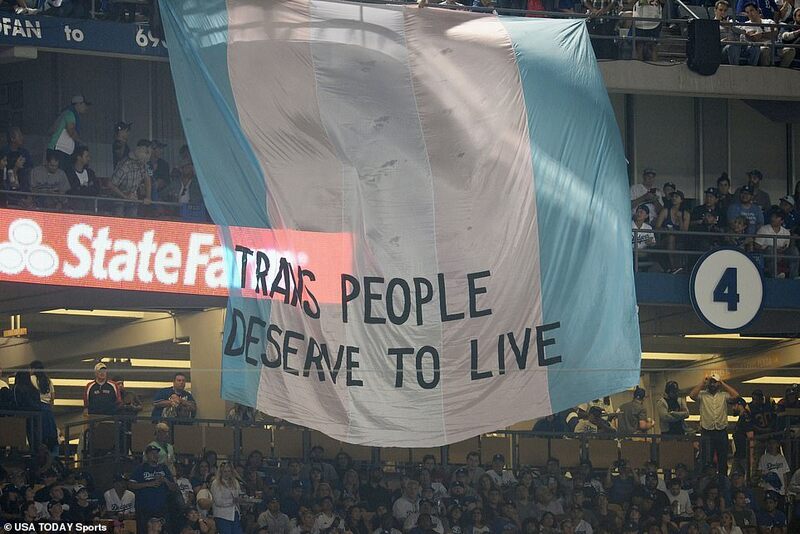 The banner comes in response to the White House’s push to rewrite the United Nation’s Third Committee general assembly policy statements, arguing that the language relating to gender is vague and politically correct. ‘Coralytics’ is what it’s called by his agent, Scott Boras. 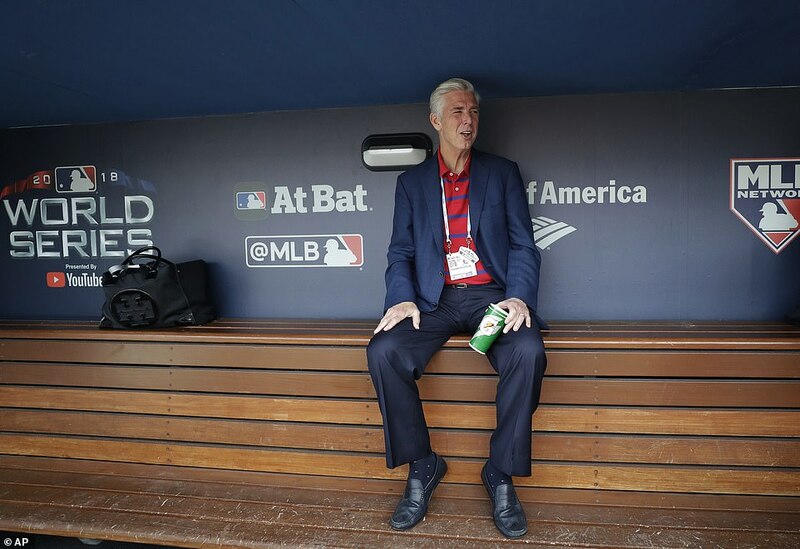 ‘It was a clear-cut choice that he was our guy,’ Dombrowski said. ‘More than anything, he’s just brought consistency,’ ace Chris Sale recently said. ‘He’s the same guy in the first inning as he is in the ninth inning of a 10-1 ballgame or 3-3 ballgame. I think that’s the overall thing as players that we take from him. ‘Ninth inning, bases loaded, one out of a one-run ballgame, and he’s sitting there eating seeds, doing the same thing as a 10-1 ballgame in the fourth inning. And I think that goes very well with us as players, when if he’s not panicking, why should we?’ Sale said.